Venue: Mayes Oyster House, 1233 Polk Street, San Francisco 94109, United States. Tickets: Early Bird Ticket: USD 5.00, Pub Crawl Ticket - TIER 1: USD 12.00, Pub Crawl Ticket - TIER 2: USD 20.00. Get your Ugly Holiday Sweaters ready for the Official San Francisco Ugly Sweater Pub Crawl! 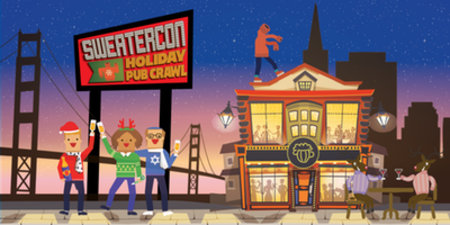 Join the Crawl SF Team at the Official San Francisco Ugly Sweater Pub Crawl! On Saturday, December 15, we will be taking over some of the best bars in the city for a jolly 'ol Holiday Pub Crawl complete with cheap drinks, sketchy holiday decorations and even a few gifts for some lucky crawlers. No matter how you celebrate the holidays, throwing back beers, holiday drinks and cruising from bar to bar is something that can be enjoyed by all. Feel free to throw on your best ugly Christmas Sweater, Hannukah-inspired gear or whatever tickles your fancy. Santa Costumes, Naughty Elves and other creative get ups are also welcome. Enjoy $3 Drinks, $3 Cocktails and $3 Shots at your favorite Polk Street Bars. CHECK IN: Pick up your Wrisbands and Pub Crawl Maps at Mayes from 4PM to 8PM. *Tickets will be available at the door. THE BARS: Mayes, Mcteagues, Lush Lounge, Blur, Vertigo, Playland and more! HOW DOES THIS WORK? Once you check in and receive your wristband and Pub Crawl Map, you can choose your own path. There will be too many people to be on a specific schedule, so you can just follow the crowd at your own pace. Specials will be available at ALL the bars during the event times.